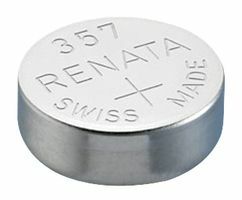 Renata 357 is a small button shape silver oxide battery with a voltage of 1.5V. renata 357 is a Silver Oxide Button Cell batteries and non-rechargeable. Do not confuse these long life SR44 Silver Oxide batteries with the cheaper LR44 alkaline version. These batteries last up to 5 times longer. These are Silver Oxide replacement batteries designed for use on continuous low drain with high pulse drain on demand. Toys such as virtual pets, talking books, etc. and many other special electronic devices requiring small, high capacity batteries.